No experience on Oahu, Hawaii is complete until you’ve tried fishing in Honolulu. Both an ancient tradition and a popular pastime, fishing is at the heart of local culture. While plenty of tourists flock to this destination for family vacations, honeymoons, and getaways, anglers the world over come for some of the best sport fishing around. Of course, who’s to say you can’t do both? Cast a few lines on your next vacation in Honolulu and experience Oahu like never before! The deep sea fishing Honolulu has on its doorstep is some of the best in the world. After all, this is where the biggest Blue Marlin on record was caught, weighing in at 1,805 lbs. Here at Oahu, deep water channels converge with the northwestern Pacific Ocean, bringing large numbers of baitfish close to shore—and their predators are not far behind. Fishing in Honolulu gives you access to Oahu’s shores along the south, south-east, south-west, and west. 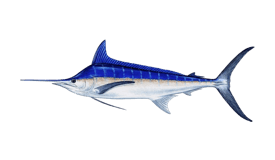 While trolling along these coastlines you might reel in Blue Marlin, Black Marlin, Striped Marlin, Sailfish, Spearfish, Wahoo (also called Ono), Mahi Mahi, Barracuda, and several different kinds of Tuna. A variety of large Sharks such as Mako and Tiger Sharks over 1,000 lbs also swim here. Bottom fishing in Honolulu is a chance to bring home a feast. Various kinds of Snapper and Grouper inhabit structures along the ocean floor, accompanied by Humuhumu, Uku, Opakapaka, and more. Closer to the surface you can target Amberjack, Barracuda, and various kinds of Trevally. On the other hand, fishing inshore allows you to explore coral reefs and lava rock flows which host a variety of colorful species. 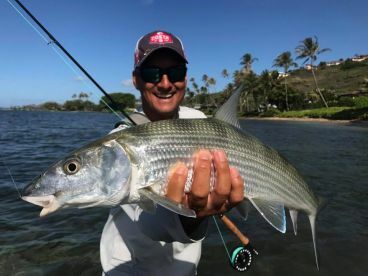 Even while shore fishing in Honolulu you can reel in some of Hawaii’s most sought-after fish, including Bonefish and Ulua (Trevally, also referred to as Papio when they are small). Most Honolulu fishing charters are based in Kewalo Basin Harbor, located minutes from downtown Honolulu. 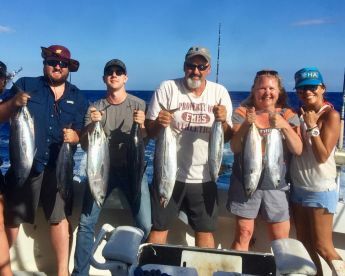 Home to one of Hawaii’s largest recreational fishing fleets, it’s no wonder that this is where you are likely to find the best fishing tours around—not just in Honolulu, but on all of Oahu. Fishing charters out of Kewalo Basin Harbor are ideal for anyone looking to fish in the Honolulu and Waikiki area. This location gives you access to Honolulu’s famous deep sea fishing and shallow water reef fishing. 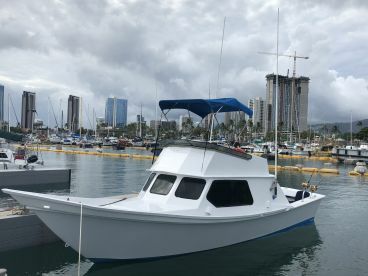 For a fishing charter straight out of Waikiki, you can find a number of boats in the Ala Wai Harbor a few minutes away, situated directly across from Magic Island. Private charters and shared trips are both available. Honolulu deep sea fishing trips are a great way to add a little world-renowned big game fishing to your vacation plans. Trips could take you in several different directions, depending on the time of year and your captain’s intentions. Off the coast of Waikiki lies a sharp drop off, where some charter boats take a turn north and head towards the island at Ka’Ena Point. This path allows you to intercept big game fish as they swim up from the deep waters in the channel between Oahu and Kauai. Fishing this side of the island also gives you a chance to cast lines along the Waianae coast, where fishermen landed that record-breaking 1,805 lb Blue Marlin. This is where you can hook into the spring run of Yellowfin Tuna before anyone else. On the other hand, You might troll the shipping lanes along Oahu’s south coast, or venture to the shallow fishing grounds south of Waikiki known as the “Pinnacles.” Many charter boats cross the Molokai Channel to the Penguin Banks, located roughly 20 miles to the south-east. 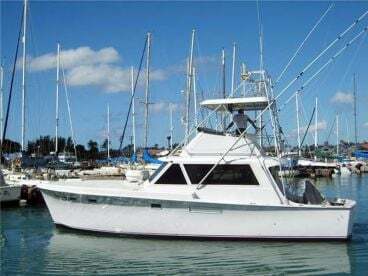 Deep sea fishing charters in Honolulu cost between $775-$1,200. Half day trips typically stay below $1,000, while ¾ day trips range from $875-$1,050. You can expect to pay over $1,000 for a full day trip, though some captains offer trips for as little as $975. 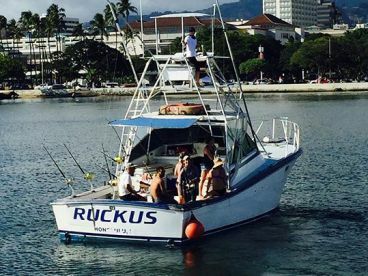 Shared charters are a great way to enjoy fishing in Honolulu without flexing your wallet. Trip prices might be as low as $180 per person for a half day trip. For a full day trip you can expect to pay around $220-$240 per person. If a high-speed chase offshore sounds too intense for your family vacation, consider some of the inshore bottom fishing Honolulu has to offer. You can fish coral and lava rock reefs in 15-25 feet of water for a variety of species including Gray Triggerfish, Papio, Akule, Opelu, Ta'ape, Snapper, Moana, Weke, and more. The water surrounding these reefs are calm and clear, giving you a chance to watch the action up close. 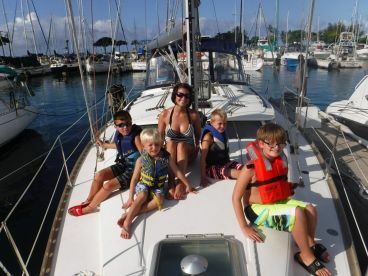 Bottom fishing trips are perfect for families with small children and vacationers who want to dabble in Honolulu’s fishing scene without heading out to sea. Private charters cost $350-$650 for a half day and upwards of $1,000 for six hours or more. If you choose a shared charter you might pay around $65 per person for a half day trip. For the avid angler who just can’t get enough, shore fishing in Honolulu is a chance to cast a few lines in between activities on your vacation itinerary. The most sought-after game fish on the shores of Oahu is Ulua. Many anglers will tell you that Ulua translates to Giant Trevally, though some use this name in reference to all local Trevally species including Bluefin Trevally (also called Omilu) and Threadfin Trevally. Many shore fishermen also target Papio, small Trevally under 10-20 lbs. But don’t let their size fool you—some say these guys pack in enough fighting power to rival a Marlin! While casting line from shore you might also land Bonefish, Jacks, Barracuda, Ladyfish, and more. Fishing at night with luminescent strips will yield a variety of colorful Panfish. Most of the Oahu shoreline is open to fishing, but always check local regulations ahead of time and keep an eye out for signs that may say otherwise. Some prime fishing spots near Honolulu include Diamond Head, Waikiki Beach, Ewa Beach, and the Oneula Beach Park west of the Honolulu International Airport. Consider Barbers Point Beach Park (west of the Kalaeloa airport) for something more secluded. The best place to fish for Ulua is up north, at Ka’Ena Point. Fishing from a number of piers in Oahu gives you access to deeper water, bringing a larger variety of fish close to shore. Piers at Sand Harbor, Wailua Bay, and Pearl Harbor are all popular choices near Honolulu. No license is required for recreational fishing in Hawaii. However, size and bag limits do apply and some species are restricted from harvest. 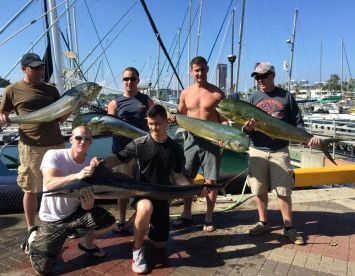 Choosing a Honolulu fishing charter is the best way to make sure you fish according to local regulations. You should plan to bring sunscreen and anything else you need to protect you from sunburn. If you are prone to seasickness, be sure to pack your own medicine. True to tradition, many captains ask customers not to bring any bananas on board (it’s bad luck!). While deep sea fishing Honolulu you will spend most of your time trolling lures at high speed (8-12 knots, depending on the species). This tactic in addition to trolling live bait or cut bait will help you land Marlin, Sailfish, Spearfish, Wahoo, Tuna, and more. Whether you are bottom fishing Honolulu’s deep sea or the shallow waters inshore, this method will bring you some of the most colorful and delicious fish in Hawaii. Snapper, Grouper, Gray Triggerfish, and a variety of other reef fish will bite jigs and live bait near the seafloor. While fishing inshore, you can use light tackle to target Triggerfish and small reef fish. Dropping jigs or live bait in water 400+ feet deep will bring you Amberjack and Ulua weighing 100 lbs or more. Snapper and Grouper are privy to hooks baited with strips of squid. Fishing the flats of Honolulu gives you a chance to stalk the ever-elusive Bonefish. The Bonefish in Hawaii average 5-7 lbs, though some can reach up to 10 lbs. Unlike Bonefish in other parts of the world, these ghostly prizes are few and far between. You will find Bonefish on sandy flats as well as deeper inshore waters near reefs. While fly fishing for this species you might also land Ladyfish, Barracuda, Ulua, and Papio. Most Honolulu fishing charters include bait and tackle. If you’re an avid angler intent on bringing your own gear, a 7-9 weight rod and a saltwater safe reel with at least 150 yards of backing are recommended. Local fly fisherman also encourage you to bring 9-12’ tapered leaders and tippets in 12-20 lbs. A full floating line is sufficient, but you may find that an intermediate or sinking line works best depending on where you fish. Anglers in Hawaii use a variety of shore fishing techniques, classified as whipping, dunking, and slide-baiting. Whipping is the most popular setup for light to medium spinning gear. This method involves casting spoons, jigs, and surface plugs for Ulua, Papio,Omilu, Barracuda, Ladyfish, and more. Dunking involves casting bait such as shrimp, octopus, or squid on hooks and sinker rigs for Bonefish and Ulua. Some say this method works best in channels and sandy-bottomed bays. Some anglers access deeper water in kayaks or on surfboards before dunking. Slide-baiting is a specialized technique used to target Ulua, typically along remote coastlines at night. This method calls for heavy tackle (12-14’ rods and trolling reels in 6/0-9/0) and deep water within a 60-100 yard cast from shore. Slide-baiting involves casting an unbaited line with a stopper and a heavy sinker on the end. The line is armed with wire hooks meant to catch on the seafloor. Once hooked, anglers then attach their bait (baitfish, moray eel, squid) to the line with a slide buckle and let it slide freely until it hits the stopper, several feet above the sinker. You can catch Panfish using the same method with luminescent strips or worms, as well as weighted flies trimmed with luminescent material. Start the year off right with a catch to remember! This is a great time to target Spearfish on light tackle or large Bigeye Tuna with lures. While fishing offshore you might catch anything from Snapper to Marlin. At this time of year you can still enjoy great fishing for Marlin and other big game fish offshore. Or fish the shallow waters for small reef fish. On Oahu, winter temperatures hover around 70°F. You can enjoy The Honolulu Festival in March, a celebration of local art, music, and dance. Take a moment to indulge in these finer things in life and then head back to the water for more great fishing! 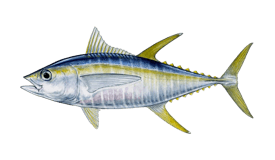 Many offshore species start biting more in spring, including Wahoo and perhaps Yellowfin Tuna. Mahi Mahi enter their first peak season. Ulua and Papio will start appearing closer to the coast. The first of May is the Lei Day Celebration. When you’re not reeling in a catch, you can enjoy crafts, food, live music, and more in Kapiolani Park. The Marlin, Wahoo, and Tuna will still be biting when you get back. Fish offshore and catch Wahoo and Yellowfin Tuna at their peak! Or reel in a big Ulua from shore. At this time of year there are plenty of tournaments to look out for, including the Kewalo Harbor Big Fish Chase. In mid summer you can enjoy great success while fishing for Tuna, Marlin, Wahoo, and Mahi Mahi. At the end of the month Albacore Tuna arrives. Or find a secluded beach and cast a few lines for Papio and Ulua. In August you can expect some of the hottest weather in Honolulu, with the sea temparture resting at a balmy 80°F. Enjoy fishing anywhere from the shore itself to the deep sea, for Bonefish, Marlin, and much more. In September you can enjoy The Aloha Festival, a state-wide celebration of Hawaiian music, dance, and history which lasts all week. Be sure to fish the shores for Papio and Ulua while they're still around. In October the Mahi Mahi peak for a second time. Fishing for Skipjack and Yellowfin Tuna should still be good, too. Or head inshore and bring home something tasty from the reefs. Even in winter, the weather in Oahu doesn’t dip below 70°F. If you didn’t make it offshore yet, this is the time! Or discover what the waters closer to shore have to offer. Striped Marlin enter their peak season in December, giving anglers a new target while fishing offshore. 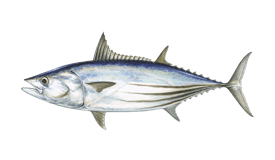 At this time of year you can still catch Skipjack Tuna, Mahi Mahi, Blue Marlin, and more. These guys are amazing!! Stop looking and book! !